Home / Articles / 2012 / How Will The U.S. Economy Fare? 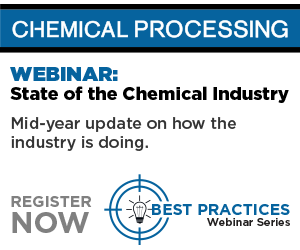 When CP needs inputs on how the U.S. chemical industry is doing, we invariably turn first to the American Chemistry Council (ACC), a Washington, D.C., trade group. Not only does its membership account for more than 85% of chemical manufacturing capacity in the U.S., but ACC also has a well-regarded economics department. So, for instance, when we decided to make our January cover story about the industry's outlook for the year, we got the group's chief economist, Kevin Swift, to write the article — "What Will 2012 Bring?" In addition, ACC supplies the data we use for our monthly "Economic Snapshot". Thus, ACC's announcement in late June of the launch of its "Chemical Activity Barometer" (CAB) definitely aroused our interest. ACC calls the CAB a first-of-its-kind leading macroeconomic indicator for highlighting peaks and troughs in the overall U.S. economy and illuminating potential trends in market sectors outside of chemistry. "The barometer is a critical tool for evaluating the direction of the U.S. economy," says the group. The culmination of an about-six-month effort by ACC's economics department, the CAB (available via www.americanchemistry.com/cab) is a composite index that pulls together chemical industry and other economic data to anticipate what will be happening in the broader U.S. economy. "The chemical industry has been found to consistently lead the U.S. economy's business cycle given its early position in the supply chain, and this barometer can be used to determine turning points and likely trends in the wider economy," notes ACC. "Applying the model back to 1947, the CAB has been shown to provide a longer lead (or perform better) than the National Bureau of Economic Research [the organization that provides the official start and end dates for recessions in the United States], by two to 14 months, with an average lead of eight months. The median lead was also eight months. At business cycle troughs, the CAB leads by one to seven months, with an average lead of three months. The median lead was also three months," ACC explains. "The CAB comprises indicators relating to the production of chlorine and other alkalies, pigments, plastic resins, and other selected basic industrial chemicals; chemical company stock data; hours worked in chemicals; publicly sourced, chemical price information; end-use (or customer) industry sales-to-inventories; and several broader leading economic measures (building permits and new orders). Each month, ACC provides a barometer number, which reflects activity data for the current month... Month-to-month movements can be volatile so a three-month moving average of the barometer is provided. This provides a more consistent and illustrative picture of national economic trends," notes ACC. No company-specific price information is included; data are aggregated to shield company- and product-specific data the groups adds. The June result reflects that production remained flat, while chemical company equities, hours worked and prices experienced slow or negative growth, and inventories rose. "In addition to the slowdown of broader economic recovery, construction-related activity has weakened as production of chlor-alkalies and some construction-related polymers declined after several months of increased production," the group notes. "After a relatively strong start to 2012, ACC's CAB is signaling a slowing of the U.S. economic recovery," says Kevin Swift. "The CAB also appears to suggest that the long-anticipated U.S. housing market recovery is emerging, but the recovery will be slow. As we look at the remainder of 2012, the CAB points to a continued weakness in economic growth in the second half of the year." ACC deserves commendations for developing the indicator. Let's hope the CAB gives us early warning of a substantial upturn fairly soon.